When vegans die, they decide to skip heaven and go straight to Sublime. Tonight my wife and I took our terrestrial selves into this South Florida vegan mecca for a special evening of drinks and dinner. We have been to Sublime before (in years past) but every time we go it just seems to get better and better. The happy hour is awesome (BOGO on cocktails and half off apps when you buy one full price). First, I ordered the Tangito (a tangerine infused Mojito) and Melanie went with the classic Mojito. Both were very well prepared and just about perfect. For apps, you can’t go wrong with the Frito Miso (we’ve had this staple before) – which despite the name is anything but Fritos. 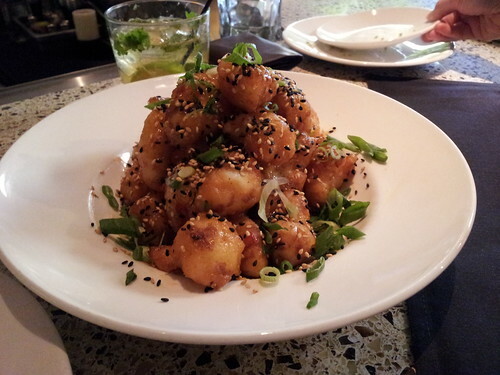 It is a bowl of crispy/tempura-like cauliflower in a seductive sweet chili sauce that will blow your mind. 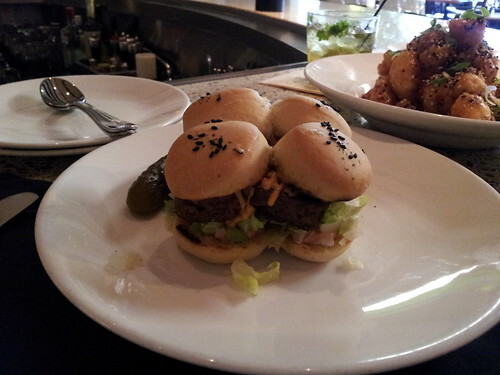 We also went with something new for us – the Sliders…which, also blew our mind with their cheddary, Gardein-y, awesomeness. The Frito Misto. You need to eat this now. But enough of the chit chat about the little stuff. Let’s talk entrees. The choices were very hard. I ended up with the enchiladas – a gamble for someone like me who is a total baby with spicy food. It was warm, for sure….just on the upper end of my spice-o-meter. But, it was still crazy awesome and just enough food to fill me up without needing a wheelchair and a linebacker to roll me out. Melanie ordered the Mushroom Ravioli, which she loved and I tried a bite – but I am also a mushroom baby and wasn’t a super fan. Not a dig on Sublime, but a dig on my needlessly picky self. It’s also cool that Nancy – the owner- makes it a point to chat with customers. Gardein sliders. Who says vegans can’t have awesome stuff? Dessert was definitely to go (how could we NOT order something?). Melanie went with the Chocolate Nirvana and I ordered the Strawberry Cheesecake. We tossed them in the car for the long drive along A1A back to Miami Beach. But, the floor heat might have been too warm for them as they both experienced a degree of meltage and, would have been MUCH better if eaten back at Sublime. I won’t review them since we totally messed them up. Bottom line, when I think of a top shelf Vegan experience in the US, I think of Sublime. Our annual(ish) visits here keep reaffirming that this is totally one of (if not, *the*) best places in the country. Beautiful morning drive to Knoxville with Wilder. All mowed and ready for the storms! Took the kids adventuring in Big South Fork NRRA today. Chased sone waterfalls, did some rock crawling and found a secret beach where Landen was able to do some casting until thunder sent us home. Every year I wish this random Scott McNamara a happy birthday. He never responds. Marking the last night of an amazing 8 weeks of paid paternity leave. We used this time as a family to build a new life in Tennessee. So thankful to @cambiahealth for this amazing benefit for dads!!! Happy to get back to work tomorrow and catch up with everyone. Took the family to Country Boy Brewing! One of the best IPAs I have had. Having a baby in the good ol' US of A! No complications. Two day, one night stay. Not all vegans drive hybrids and wear skinny jeans. Beyond Burgers at Carl's Jr!